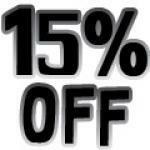 Buy BCAA Capsules at a Special Price of Rs.849/-. One of the challenges in maintaining focus during intense training and physical exercise is mental fatigue. Whereas most athletes worry about and take corrective action to ward against muscle fatigue, mental fatigue must be combated as well. In fact, recent research has placed increasing emphasis on mental fatigue during exercise. This mental fatigue is commonly referred to as central fatigue because of the involvement of the central nervous system. While central fatigue does not affect muscles, it can reduce the capacity to perform optimally. There is a correlation between the amino acid tryptophan in the brain and the degree of mental fatigue. Upon entry into the brain, tryptophan has the ability to "calm" the central nervous system, causing sleep and drowsiness. Normally, there are sufficient amounts of branched-chain amino acids (BCAAs) circulating in the bloodstream to control the entry of tryptophan into the brain. During long-term and sustained exercise, however, muscles use large amounts of amino acids as a source for energy. The body prefers to use BCAAs for energy, since they readily replace glucose in the energy production pathways. As muscles begin to use BCAAs, the amounts of these amino acids drop, which allows tryptophan to enter the brain, inducing fatigue and tiredness. Research shows that supplementation with branched-chain amino acids can prevent central fatigue by tightly regulating the influx of tryptophan to the brain. Supplementation before and during exercise has been proven to enhance performance. 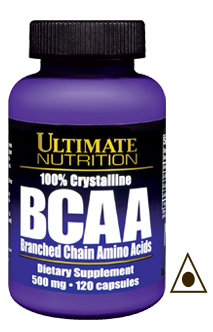 Branched-chain amino acids include leucine, isoleucine and valine. These amino acids are needed for the maintenance of muscle tissue during physical stress and intense exercise. From the perspective of athletes, BCAAs function as anabolic agents and induce sparing, which allows the body to burn fat and not muscle. Nutrient needs often increase faster than calorie needs in athletes. Ultimate Nutrition is committed to providing athletes with the best products to fulfill exactly those needs. Ultimate Nutrition's 100% Crystalline BCAA is one product designed to increase endurance, lengthen the time to fatigue and improve performance. 1. What Are the Natural Sources of BCAAs? 2. Could One Be Deficient in BCAAs? Periods of intense physical stress, such as intense weightlifting and long-distance running, can create a so-called catabolic state in which muscle tissue is broken down faster than it can be recovered and replenished. 3. What is the Optimal Dose of BCAAs?